Today we will discuss the final aspect of a prepurchase examination: the decision to pursue further diagnostic tests. Radiographs are commonly utilized to aid the veterinarian's evaluation of your prospective purchase. In some cases, ultrasound, upper airway endoscopy, and blood work also may come into play. Let's look at each individually. There are two reasons to take x-rays. First, to obtain further information about a specific anatomic region because of abnormal findings during the clinical portion of the exam. A very common example would be a horse demonstrating a mild to moderate positive response to upper hind limb flexion, but no other signs of lameness. 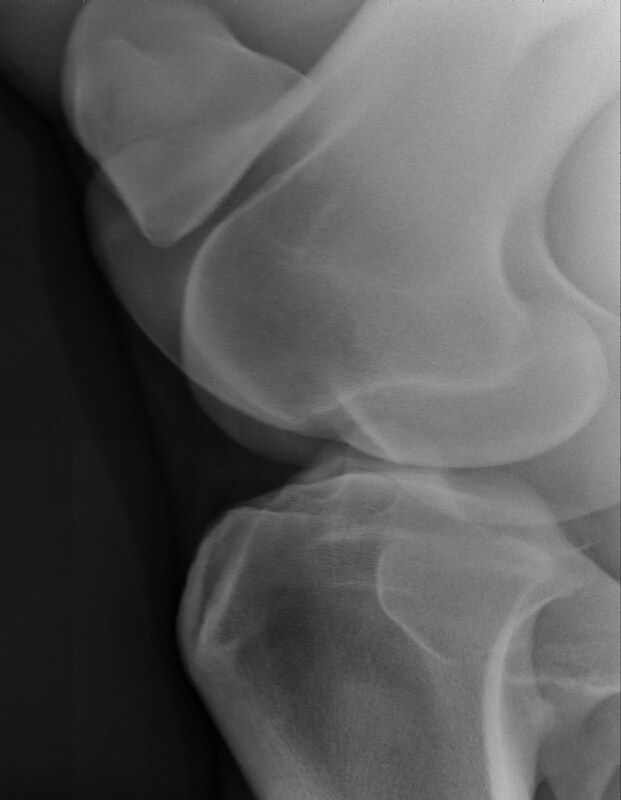 Degenerative joint disease (djd) of the lower hock joints is very common in athletic horses (search blog entries for "hock" to review this subject) and often is quite manageable with appropriate medical therapy. Therefore, hock radiographs are one of the most commonly obtained diagnostic series during prepurchase exams. The second reason to obtain radiographs of the horse you are considering is to look proactively for radiographic abnormalities which may cause lameness problems in the future, or affect your ability to resell this horse, even though they are not causing clinical problems at this time. The most common anatomic areas investigated for these reasons are feet and stifles, but may also include fetlocks and carpi (front knees). So how do you decide whether to request radiographs? If your intended use for your new horse is pleasure riding or light competition, the horse is in full work and has a complete history, and the clinical examination of the horse is normal, you may choose to forego radiographic evaluation. On the other hand, if you are buying a high level performance horse, if you are planning to re-sell the horse in the near future, if the horse has not been in full work prior to the prepurchase evaluation, or if there are any questions which arise after the horse's clinical evaluation, then you should seriously consider additional diagnostic tests based on consultation with the veterinarian conducting the examination. One final word on radiographs: they sometimes open a can of worms that may be confusing to you. While some radiographic abnormalities are straightforward, many are open to various interpretations. If the horse you are looking at has abnormal radiographic findings in the absence of a corresponding clinical unsoundness, the veterinarian must give you their best professional opinion on the significance of the x-ray findings, but remember: they don't have a crystal ball! Once again, this brings up the importance of having a good performance record on your prospective purchase to help the veterinarian performing the evaluation interpret the significance of radiographic findings. Ultrasound of the soft tissues of the distal limb, specifically suspensory ligament, superficial and deep flexor tendons, may be considered in higher level performance horses. However, ultrasound imaging has not been standardized to the same extent as radiography, and ultrasound actually is not a sensitive tool for determining subtle changes in soft tissues. I do not recommend ultrasound as part of a routine prepurchase examination. Upper airway endoscopy usually is reserved for upper level performance horses such as race horses and upper level endurance horses. During the exercise phase of the clinical evaluation, the veterinarian will ask the horse to canter long enough to elevate both heart rate and respiratory rate and will evaluate these systems immediately after exercise to look for any indication of upper airway problems indicating a need for endoscopic evaluation. Blood work is not a bad idea. Although very unusual, it is possible for a horse to be harboring a chronic inflammatory or infectious condition without showing outward clinical signs. A complete blood count and chemistry screen can rule out the possibility of an underlying problem. A toxicology screen testing for sedatives, analgesics (pain killers), or other behavior modifying drugs may be indicated in certain situations. If you request a "tox" screen, be sure to ask the veterinarian what how long it will take to get results of this test - it may be up to a week, and thus you must factor this delay into your negotiation with the seller. So that's the story on prepurchase examinations. I strongly recommend you have a veterinarian conduct at least a full physical examination and basic lameness evaluation on any horse you plan to purchase. There are many problems that may not be apparent to either the seller or buyer that a vet can identify for you and help you understand before you make the decision to bring a new horse into your life. this is a great article and was very helpful, my prepurchase is tomorrow!